New York’s Times Square is where all the action is at. After all, we have seen how Mario’s 3D world ended up at the iconic place slightly more than a year ago. 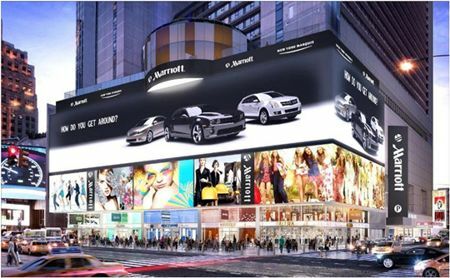 This time around, the next attention grabbing thing to appear on Times Square would be Mitsubishi’s Diamond Vision display, where those over at 1535 Broadway will be able to check out this humongous display – just remember to wipe the drool from your mouths once you’re done gaping at it in awe. The Diamond Vision display will offer more than what 4k ultra-high-definition pixel density has at the moment, despite the entire screen measuring a mammoth 25,610-square feet, while offering a pixel density of 2,368 x 10,048. In other words, this would be the highest resolution LED video display around the world, and this installation is made possible thanks to a Mitsubishi Electric Diamond Vision AVL-ODT10 large scale display which delivers true 10mm pixel pitch spacing. Apart from that, it will make use of a 3-in-1 surface mount LED (SMD) that boasts of Mitsubishi Electric’s revolutionary Real Black LED technology. As this unique billboard, if you can call it that, sports high resolution and pixel density, Mitsubishi Electric has supplied a special control system in order to provide pixel-to-pixel mapping of content and life-like images. The entire image area of the screen can then be segmented to show off multiple pixel-for-pixel 1080 HD or 4k images simultaneously, while the display canvas itself paves the way for a couple of 4k images to be displayed side by side, where the pixels will remain in the height and width for other content. Surely this coming New Year countdown is going to be different.